A couple of days ago, I wrote about Clemens Schneider’s hypothesis, presented at the European Students for Liberty regional conference in Maastricht, that 1356 was a very important year in European history because of two events that promoted decentralization and federalism. But I spent 90 percent of my speech saying there was very little hope of that happening. I highlighted three points. Europe is suffering from anemic growth and is falling further behind the United States. Demographic changes in Europe will likely cause even further economic stagnation. 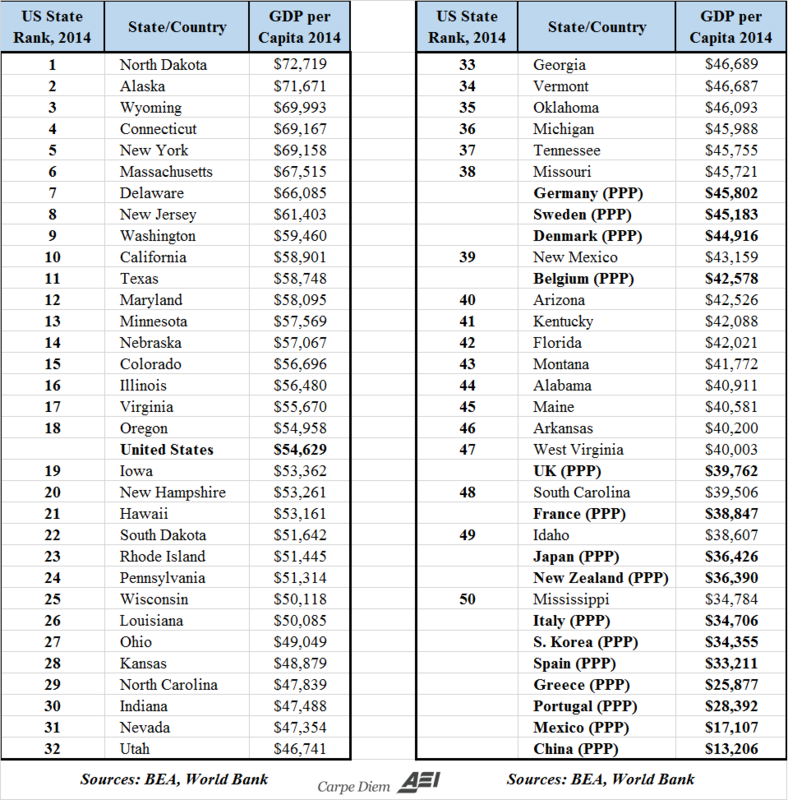 An ever-rising burden of government spending will further cripple economic performance. To tie all these points together, I pointed out that worsening fiscal policy doesn’t necessarily mean economic decline. If nations make sufficient improvements in other policy areas (regulation, monetary policy, trade, rule of law and property right), then it is still possible to have more overall freedom and a stronger economy. Indeed, that’s basically what happened in developed nations after World War II. But that hasn’t been happening in the 21st Century. Here’s a chart I prepared for the students showing changes in overall economic freedom in the major nations of Western Europe from 2000-present. 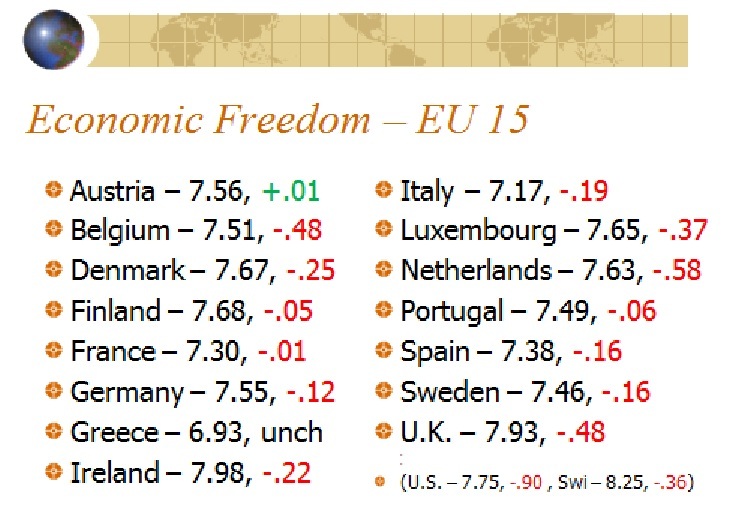 As you can see, other than Austria’s tiny increase and Greece’s unchanged (but still lowest on the list) score, economic freedom in Europe has been eroding. Indeed, the average decline is about .2 on a 0-10 scale, which isn’t trivial. I also included the United States, which unfortunately has experienced the biggest decrease of all nations (thanks Bush and Obama!). And I’m disappointed that Switzerland (one of my favorite nations) also has moved in the wrong direction. To conclude, there was a reprehensible American journalist named Lincoln Steffens who made a trip to the Soviet Union in 1919 and then told American audiences that, “I have seen the future, and it works.” Some might argue we shouldn’t judge him too harshly since it took time for the barbarity of communism to become apparent, but any ideology that puts the state over the individual is a priori evil in my humble opinion. But I’m digressing. I cite Steffens’ infamous quote because I, too, have seen the future. It’s Europe. And it doesn’t work. P.S. I did point out that the outlook for European is not theoretically hopeless. Even Greece could climb out of its statist malaise with sustained spending restraint and other market reforms. P.P.S. My indictment of Europe, I explained, should not be interpreted as an endorsement of the United States. I explained that our long-run outlook was similarly grim (and will probably accelerate in the wrong direction because of the election). P.P.P.S. Which is why I told the students in my conclusion that they should apply for Australian visas.